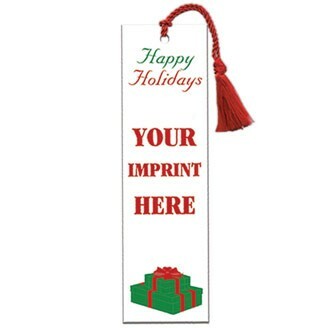 Make a mark on your customers with this stock graphic Happy Holidays with gift boxes design bookmark. Great give-away to promote a school, library, book club, conference, save the date, a new book, author or website. Price includes custom imprint in either red or green, one side, 14 pt. liquid laminated paper board front for a high gloss finish, uncoated on the back. Optional tassel available. Made in the USA with quick turns, just ask.